2018 was a good year for mushrooms here in NE PA, especially from mid July through most of November. The annual precipitation measured at our local NOAA set a new record by over an inch! Boletus edulis. The ones in the photo are more red than usual, for the local type(s). I submitted several samples of local edulis to a researcher in Utah. Mycena crocea is the "Walnut Mycena". These were part of a group found growing on nuts/debris from a shagbark hickory tree. Most field guides use the name "Mycena luteopallens". I'd call this Hydnellum peckii, although there is a look-alike species. A species of Bisporella, very likely B. citrina. Even with spore measurements it's difficult to confidently ID to species. The always photogenic Amanita muscaria var. guessowii. Amanita jacksonii is the classic North American "Caesar's Amanita". The provisionally named species Amanita cyclops is presently only known to occur in one small patch on a path in the northwest corner of my property. Caloboletus inedulis has a very bitter taste. I use a $100 Cannon "point and shoot" camera, settings on automatic, model name written on the unit is no longer legible. Actually, I think my old SONY that fell into a creek a few years ago was a better camera. I like the manual macro setting better than the auto-macro focus on my Cannon. But, one way or the other, my best photos are usually the result of snapping lots of pics from several different angles in variable lighting that is intentionally manipulated. I think that Mycena crocea pic was the only one out of 20-30 that I really liked. Hey Dave. Do you post photos on Instagram too? I haven't used Instagram. Mostly I post mushroom photos here and on Mushroom Observer. Here's a few more from 2018. Horse Mushrooms (Agaricus, a species from section Arvenses. Agaricus section Xanthodermatei, with medicinal odor, probably a sickened. Agrocybe species (I think A. putaminum). Amanita rooseveltensis, a new provisionally named species that is common on lawns near oak or hickory. Auricularia (Tree Ears). For a short time the NA Tree Ear was called A. americana. Currently split into a few newly-named species. Baorangia bicolor, the classic "Two-color Bolete" (formerly Boletus bicolor). Dave can I assume the 'cyclops' Amanita is one you discovered on your own? I'm really hoping to hear you found an undiscovered species. Amanita cyclops is a provisionally named species. Hopefully, the viability of this taxon at the level of species will stand the test of time. I am listed as one of the three co-authors of the species. Rod Tulloss and Linas Kudzma are other two coauthors. 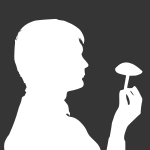 Rod is an authority on the genus Amanita; he has authored many species. Linas is a retired chemist who extracts DNA sequences in his basement lab. To date, I haven't seen any amanita observations that really look like A. cyclops, other than those I have collected. Rod has been studying section Vaginatae of genus Amanita for several years now. (It has been a daunting task, classifying the species that comprise this diverse group.) He has been accepting collections for study, and when I first collected this type --growing on a mowed path on my property-- it seemed to be unique. Subsequent fruitings of this fungus in the same spot produced mushrooms that had the same macro-characteristics... cap with dark central umbo and deeply grooved margin, short/squat stature. DNA sequences were obtained. Name looks good so far. Rod designated me as co-author on a few other provisional species names, including A. rooseveltensis (seen in the group directly above). We worked on one name together, Amanita advenienticometa ("Arriving Comet" Amanita). It was my idea, based upon the cap having streaks radially emanating from a dark disc... looked like material streaking off an approaching comet. But, as luck would have it, DNA analysis eventually showed "advenienticometa" is the same taxon as what Yves Lamoureux had previously named "Amanita elongatior". The older name took preference, and so my "comet amanita" disappeared into myco-space 😞 But, like other comets, it may return. Rod likes the name; he wants to eventually use it again. Pictured below. (Photos from 2014).